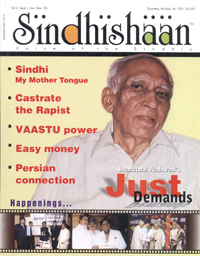 I am overjoyed to read your esteemed Sindhishaan of the recent issue (Oct. – Dec. ’02) on Sindhi woman. You and Shri Arun Babani have done a commendable job – tremendous efforts and attempts to collect information on Sindhi women of yesterday, today and probably insight of tomorrow. Editorial from the Editor’s Desk by R. Butani, Editorial Afterword by Arun Babani – masterly written. Articles are literary pieces, information is exhaustive and complete in a capsule form. I wish and advise to make it a multifacet magazine - 2 or 3 articles on Sindhis-modern topics like computers, health, Sindhis abroad, other aspects of Sindhis from food to clothes,poverty to riches, life and culture, one page for Sindhi poetry (English rendering) Apathy to Sindhi language and culture should also be effectively highlighted. It should not be just flattery and praise, the other side of the community should be brought out to educate and improve their future lot. For instance lack of ‘unity among the Sindhis’. Selfish, self-centred, money making traits, neglect of language, culture, showy and superficial philanthropists, manipulation of awards, the list is incomplete. March on Sindhishaan. Sindhi flag on the top! Mohen-jo-daro/Indus Valley Civilization shall prevail again. History repeats itself. Time is not linear but cyclic. Wishing you all Happy Diwali and New Year.